This folded screen presents a then-and-now view of Mexico City. 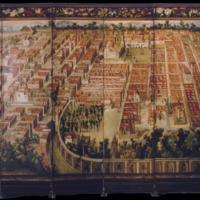 This oblique view from the east of the city depicts 17th century Mexico City as a peaceful place, with the Viceregal palace at its center. This standing screen was created in Mexico, although the format—of painted panels that could fold or extend into space—was introduced into New Spain from Japan. This view of 17th century Mexico City gives little evidence that the Spanish colonial city stood directly atop Aztec Tenochtitlan. The great Templo Mayor once stood slightly to the west of the site of the Cathedral, the large building directly to the right of the central axis of the biombo. Adjacent to the Cathedral, one can see the façade of the Viceregal place, which, ironically, would be burned by mobs in 1692, angered over the escalating price of maize. The palace, home to the Viceroy, stood on the same site as the palace of Moteuczoma, the last Aztec emperor. The rectangular blocks of the carefully planned city were filled with buildings to the street line. Central courtyards allowed light and air to enter interior rooms. The painter has compressed the view of the city to include the shrine of the Virgin of Guadalupe, seen in the upper left corner. Built adjacent to a former shrine to an Aztec earth goddess, the basilica held a miraculous cloak with the Virgin’s image, revered by indigenous people and Creoles alike. The entire scene is framed by a floral pattern, a frame found on other biombos from New Spain. As with most biombos, the maker of this work is not known. But it was certainly the work of many: a painter to work the canvas, and a carpenter to fashion the screen. Some biombos also have gilding which would have required the handiwork of yet another artisan. Biombos like this one were often painted on canvas, then mounted on the wooden panels and hinged to make screens. The most elaborate are painted on both sides with different scenes, as is this one. The biombo stands almost 7 feet in height and stretches nearly 18 feet in length (ca. 213 x 550 cm). Folding screens that could be used as furniture were first brought to New Spain from Japan. Across the 17th and 18th centuries, they were made in Mexico to decorate the rooms of elite homes. Many are now found in European collections, suggesting that they were taken back to Europe as souvenirs by wealthy members of the Viceregal court. Although the Spanish city effaced its Aztec predecessor, much of the pre-Hispanic city never went away. The pattern of canals and causeways remained, as did the sacredness of sites throughout the city.